There are few things that are more synonymous with traditional Japanese life than the geisha. Accomplished in the arts of dance, tea ceremony and music the geisha were the entertainers of the Japanese tea-houses. Even before Arthur Golden’s novel “Memoirs of a Geisha,” became an international bestseller the image of a geisha was instantly recognizable the world over. A face covered in thick makeup as white as snow, bright red lips, and a silk kimono depicting a whole landscape in minute detail wrapped around her body. The sight is truly stunning and one of the few things more impressive than seeing a Geisha is to become one yourself. If you are not willing to give up a large portion of your life in training to become a maiko, and even later a fully-fledged geisha then there is another possibility. The experience is only temporary but for an hour you can become just like one of the women who graced the streets of Gion and entranced all who saw her. On a cold and rainy January afternoon an English and an Australian girl visited a small business near Kyoto’s Kiyomizu temple where with some makeup, wigs and a choice of over a hundred kimonos they were transformed. The following are exerts from Becky’s diary. “Tish and I were first lead into a small changing room on the first floor, where one of the assistants told us to remove all our clothes except our underpants. After a brief moment of shyness we were given thin white gowns, similar to ones worn in operations that tied at the front. Shivering a little as it was still mid winter we were then ushered up to the 3rd floor where the transformation would take place. First our hair was tied back into little caps so that we looked a pair of pixies. Then came the thick layer of white makeup. 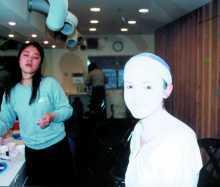 It felt cold and smooth as it was smeared onto our face and wasn’t unpleasant but I was shocked to see the off-white color my teeth and eyeballs had taken on. With a white base to work on they then did the detail of the scarlet eyeliner and the deep red lips. From the make-up room we were taken into a long thin room full of beautifully intricate and richly colored kimonos. I remember being really indecisive, I wanted to spend hours browsing before choosing but I knew it was an almost impossible task so I choose a lovely simple red one just to be done with it. I was then lead into the dressing room, two women immediately set to work on me. A hard board was tied around my chest to flatten my breasts and although I am sure I now had excellent posture I felt winded and very restricted. Then came the kimono, which was assembled in seconds, and finally a tight and surprisingly heavy wig was placed on my head. I was given then nod that I was finished and I headed in to the other dressing room to look for Tish. As I entered the room I saw an amazing looking Geisha at the other end. I started laughing and began to tell her how I could only walk in tiny steps when I recognized the beautiful Geisha’s red kimono. 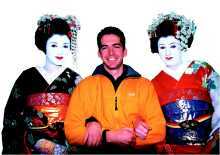 I suddenly realized the Geisha I was talking to was me. I couldn’t believe I didn’t even recognize myself. 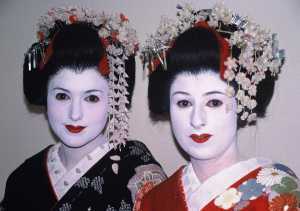 Becky and Tish were transformed at “The Four Seasons,” Kyoto. Packages range from ¥9,500 upwards depending on how many photos you want and whether you wish to take a stroll out in public while dressed as a Maiko, Geisha or Samurai.